One of my all-time favorite sandwiches is egg salad. It’s also one variety of sandwich that, when I take a plate of sandwiches somewhere, is sure to go first. The filling can, of course, be made very simply with nothing more than hard boiled eggs, salad dressing or mayonnaise, and some celery and onion, if desired. 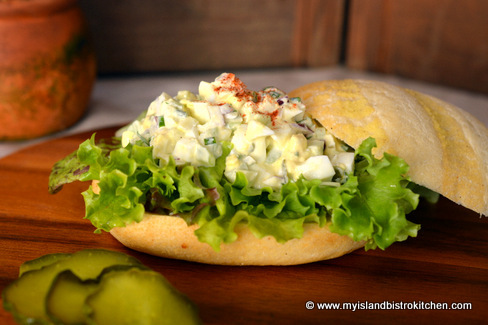 I like to jazz up my egg salad filling a bit by adding some ingredients that give an additional flavor boost to the sandwich – prepared mustard, sweet pickle relish, lemon juice, fresh herbs, and just a smidgen of a fine quality white truffle oil. Add some fresh lettuce and place this filling in a good quality roll or between slices of your favorite bread for a decadent lunch. 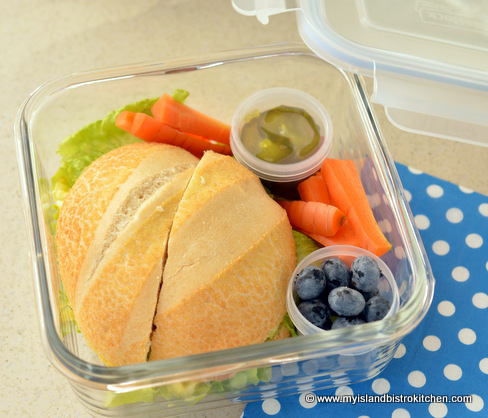 I take my lunch to work and it’s always a special treat day when I take the time to prepare an egg salad sandwich and pack it with some fresh veggies and fruit! And, don’t forget the pickles! 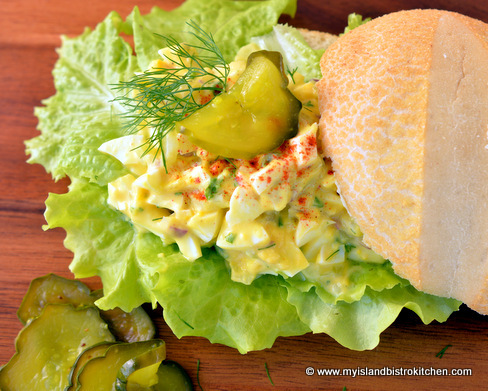 Crunchy bread and butter pickles go great with an egg salad sandwich. The eggs for the filling can be either diced or mashed according to personal preference. Dicing the eggs results in a more rustic looking sandwich like the one shown in the photo below. 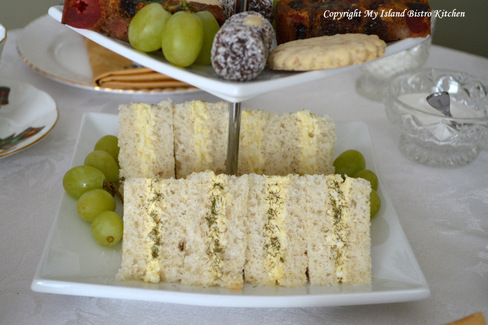 However, if I am making egg salad sandwiches for an afternoon tea, then I mash the eggs with a fork or small potato masher as it makes a creamier filling that stays neatly in place between the bread slices as shown below. Either bought or homemade salad dressing or mayonnaise can be used in this sandwich filling. Sometimes, I add a little of each. I recommend starting with a tablespoon (or even slightly less) of the salad dressing or mayonnaise and then adding small amounts as necessary to achieve the desired consistency of the salad filling. Place eggs in medium-sized saucepan. Cover with enough water that the eggs are completely covered by at least 1” of water. Bring to a full boil. As soon as the water is at a full boil, remove saucepan from heat and let the eggs sit in the hot water for 12 minutes. Drain the hot water and rinse eggs under cold water to stop the cooking process. Let eggs sit in a saucepan of cold water for 4-5 minutes then peel and dice (or mash) them. Place eggs in bowl and add all remaining ingredients. When adding the salad dressing or mayonnaise, start with 1 tbsp and add more until mixture is of desired consistency. Stir well to combine ingredients. Butter bread slices or roll halves. Place lettuce on bottom halves of each sandwich or roll. 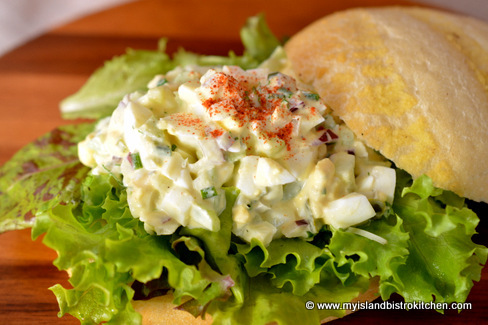 Top the lettuce with the egg filling, dividing equally between the two sandwiches or rolls. Sprinkle with paprika, if desired. Place remaining roll tops or bread slices over filling and slice as desired. 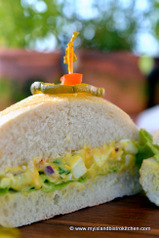 A flavorful egg salad sandwich perfect for any occasion that calls for a sandwich!